1. Preheat oven to 200°C/180°C fan-forced. Line a large baking tray with baking paper. 2. Cut each potato into 2mm-thick slices. Place in a bowl. Add oil, garlic and thyme. Season with salt and pepper. Toss to combine. 3. Reserve 1 tablespoon parmesan. Place 8 potato slices on prepared tray. Sprinkle each with a little of the remaining parmesan. Top each with another potato slice. Repeat layering with potato and parmesan until the stacks are about 4cm in height (about 10 potato slices). Sprinkle stacks with reserved parmesan. 4. 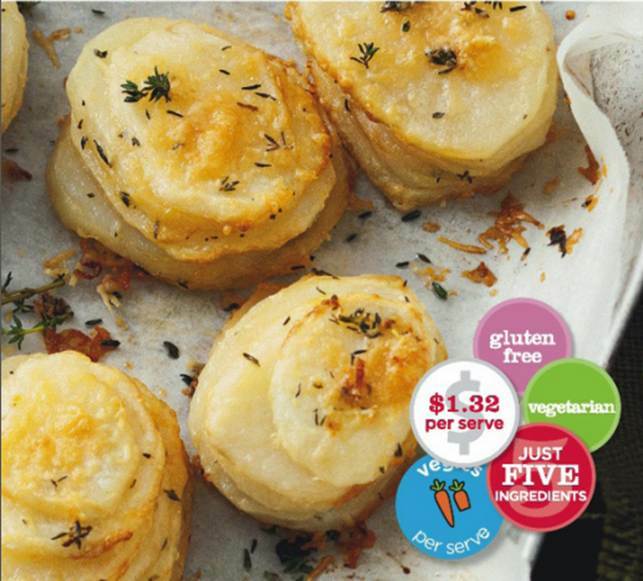 Bake for 30 minutes or until golden and crispy, and potato is tender (check by inserting a skewer or small, sharp knife into centre of a stack). Sprinkle with extra thyme leaves. Serve.